For many of the swimmers, this was the first time they have swam as part of a relay at such a prestigious event. Many were nervous, but they supported each other so well as a team and we're super proud of them! All were chosen due to their excellent aptitude and ability to concentrate, push themselves to get the most from their training and increase in confidence. Well-done everyone! 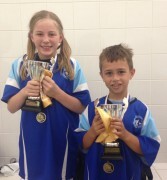 Sophie and Daniel Andrews have been chosen for this award for their excellent attendance, attitude and improvement. Keep up the fantastic work! Keira was nominated by two coaches who felt that she has good attendance, listens well and puts in maximum effort during training sessions. Lachlan was chosen as his strokes have all improved considerably and the coaches are impressed with his efforts during training. Well-done, keep it up! Considering the short time Theo has been swimming with Halstead, Gary feels his improvement has been tremendous; being able to concentrate and take on board what is being asked of him with enthusiasm and effort. Emily is becoming an I.M. swimmer with all strokes in place; her workmate and listening skills are fantastic. 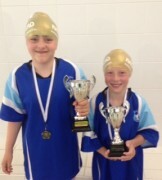 Well-done both of you - keep up the good work! Both swimmers have excellent attendance, are listening well and working incredibly hard during training sessions - well-done, keep up the good work! Also pictured is Jack, who was on holiday when the Junior Relay Team were awarded the Swimmer of the Month award last month - super work Jack! The teams showed excellent commitment to training. They worked exceptionally well as a team; supporting and encouraging each other, and also showed great energy and enthusasiam. Well-done everyone! 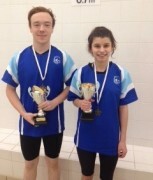 Esme for swimming an incredible 706 lengths at the Sponsored Swim and Thomas for his work and effort in getting his 100 Free time down to under a minute! Fantastic! 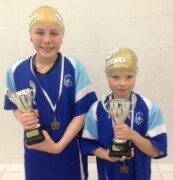 Both swimmers were chosen because of the hard work, good listening and excellent improvement they're showing. Well-done! 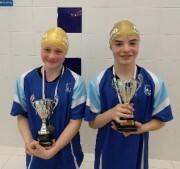 Kiera was nominated for performing very well during training sessions and during Club Champs. 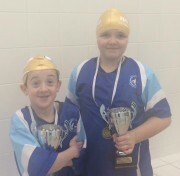 Joshua Roughan was nominated because despite being new to the club and swimming against older swimmers during Club Champs, he tried his best. Well done! 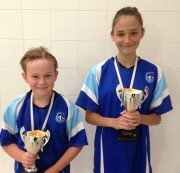 Both were chosen for making good effort, listening well and showing improvement. Well done - keep up the hard work! Thomas impressed Paddy and Roger during a Sunday morning swim, he's making excellent gains on his PB's during training and working really hard. 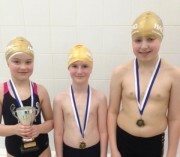 Three coaches feel that Amber is making huge improvements all round with her swimming. Keep up the good work!